Just in time for Tom Hanks’ major motion picture, Greyhound ( May 8, 2020), historian Clint Johnson is revealing the real stories in Hank’s fictional film through Tin Cans & Greyhounds: The Destroyers that Won Two World Wars. Tin Cans & Greyhounds is an action-packed narrative that gives American-history readers a perspective of the fight for victory in World War II they aren’t used to—through the portholes of the destroyers that won the war. This book contains an action-packed narrative history of destroyer-class ships who began as torpedo boats in 1898 and were last used in the Vietnam War. These destroyers were nicknamed “tin cans” because they had thin, metal hulls that were useful for quickly navigating the seas but not so great for protection of the soldiers that they transported. 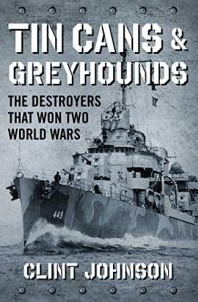 Their quick speeds gave them their second nickname, “greyhounds.” Survival on a destroyer was not guaranteed. While reading this book you will find yourself inside the quarter-inch hulls, meet brave soldiers who manned the five-inch guns and fought wars while risking death by cannon shells, shrapnel, fire, drowning, exposure, and……sharks. The destroyers’ thin hulls made these ships versatile as they were used as swift scouts, able escorts, and gutsy rescuers. Without the destroyers, WWII may have been lost. Meet the author: Clint Johnson has written more than a dozen American history titles including A Vast & Fiendish Plot: The Confederate Attack on New York City (2010) and one foray into history and politics in The Politically Incorrect Guide to the South (2007). Other books he has written are Civil War Blunders: Amusing Incidents From the War, Pursuit: The Chase, Capture, Persecution, and Surprising Release of Confederate President Jefferson Davis, and Bull’s-Eyes and Misfires He graduated from the University of Florida with a degree in journalism and has written newspaper, magazine, and trade publication articles. No account of destroyers would be complete without the tale of “Taffy 3” (TF3). Never heard of it? Look it up! lying history books. Read “Target Patton” by Robert Wilcox and a sequel in American Thinker in 2011.